Laguna Beach is perhaps Orange County's least-overdeveloped beach town and one of its prettiest. Created as an artist's getaway, Laguna Beach retains its artistic passion, with excellent art galleries and fun summer arts festivals. You'll find great beach atmosphere in Laguna, too. Before we tell about all the fun things you can do in Laguna Beach, take a moment to decide whether it's a place you would like to go. If you're a shopper, you'll find plenty to keep you entertained in Laguna Beach. The streets are lined with clothing boutiques, jewelry stores, art galleries, and shops selling decorative items. A few t-shirt and souvenir shops mix in but don't dominate. Its seaside location sets the mood for romance. Laguna Beach can also keep you busy for an entire weekend. Especially if you go during the Festival of Arts and Pageant of the Masters or for the alternative art fair, the Sawdust Festival. Laguna Beach is great almost any time of year, but like most of the California coast is susceptible to "June gloom," when, like a cranky child, the sun may refuse to come out for days on end. During the summer and especially during the arts festivals, it can get very crowded. September and October are excellent times to visit when the offseason begins, with lower hotel rates. The weather is sunny, and things are less crowded. If you've only got a day, take a walk on Main Beach and browse through some of the shops. Shopping: The walkable downtown part of Laguna Beach extends along Forest Avenue and Coast Highway. You'll find art galleries, clothing shops and local boutiques offering all kinds of wares. Take a walking tour: Pick up a brochure at the Visitors Center (381 Forest Avenue) for a self-guided walking tour of the bungalows, cottages and historic homes built by the early residents. Laguna Playhouse: This repertory company is the oldest continuously operating theater company on the West Coast. They stage a variety of works, including some local and world premieres and productions which have won awards from the Los Angeles Drama Critics Circle. Greet the greeter: The Laguna Beach Greeter tradition started in the late 1800s when local character Eiler Larsen decided to say hello to visitors. Today's Greeter hangs out on the corner of Brooks Street and S. Pacific Coast Highway. While you're saying hello to him, explore Laguna's HIP District. It's a little bit out of the busy downtown scene, more informal and full of funky shops and charming buildings. It stretches from Thalia to Bluebird Canyon along PCH. Divers, explore a sunken ship: The wreck of the Foss 125 lies about 175 yards off the coast at Cleo Street in about 60 feet of water. If you'd rather snorkel, Goff Cove is well liked for that. Check out the tidepools: Pick up a tide chart from the visitor center at 381 Forest Avenue to find out when it will be low. Some hotels also post the daily tide schedule. A few good places to go are the shoreline just below Heisler Park. Treasure Island at the bottom of the ramp on the southwest corner of the Montage Resort. The resort has tidepool docents on hand at low tide on busy weekends and holidays. California artists on display: The Laguna Beach Art Museum specializes in works of art created by California artists or which represent California life and history. It's a good place to see the work of some great contemporary California artists, as well as the best of the past. 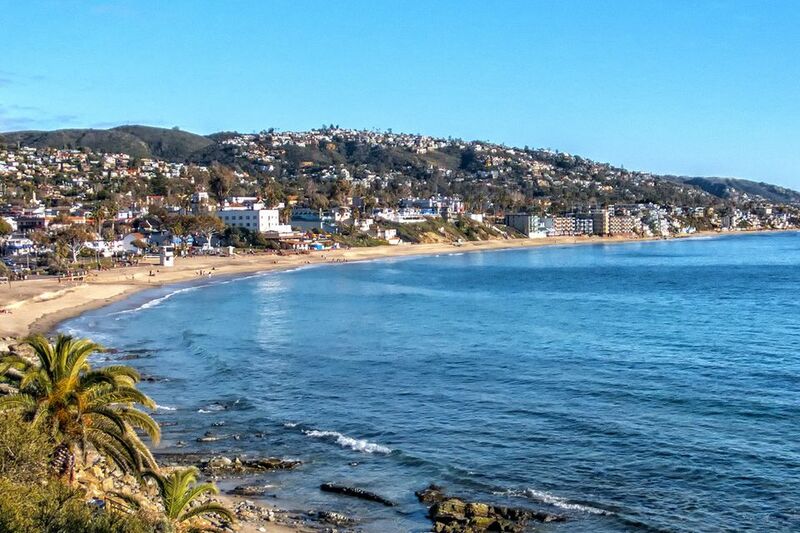 Laguna Beach is a lovely spot to base your weekend getaway, but depending on how active you want to be, you may have to mix in a few activities in nearby Newport Beach or Dana Point. Laguna Beach has some great summer arts festivals. The Pageant of the Masters is so much fun - and so unusual - that we have an entire page dedicated to it, where you can find out what it is and why it's so justifiably famous. Its companion Festival of Arts is a juried art exhibition exhibited in an outdoor setting. In August, the Sawdust Festival features only Laguna Beach artists - more than 200 of them. The Doheny Blues Festival, held in mid-May features singers such as Bonnie Raitt and the Tall Ships Festival happens in September. Both are in Dana Point, just down the road. Parking is limited, and Laguna Beach is very popular. Get there early to snag a spot. All of the meters in town take credit cards, but you can still use coins if you want to. Most meters have a two-hour limit. You might want to check this handy resource ahead of time. It lists all the public parking lots in town. On busy days, traffic backs up along Pacific Coast Highway. Instead of inching along being frustrated, think about stopping somewhere, parking and going to the beach. If you're south of town, try going a block uphill and following a street parallel to Pacific Coast Highway. During the summer art festivals, the city operates free shuttles from remote lots to town and along Pacific Coast Highway. They make it easy to get around without having to drive. Get the app: You can get real-time trolley information and find places around town using the free Visit Laguna Beach app. You'll find public restrooms at the beach, but they're often busy. Instead of joining the queue, walk up Forest Avenue, where you'll find signs directing you to a couple of places to "go." If you bring your four-legged friend with you to Laguna, you need to know the rules about taking them to the beach. It's easy enough these days to go looking for a hotel at your favorite travel booking site. But they don't tell you everything you need to know about locations. They don't mention things that can cause you to end up in a place that's not ideal for you, too. Before you go checking at random, get the inside track on how to find a place to stay in Laguna Beach.